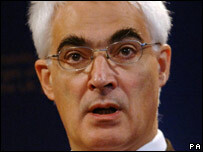 Chancellor Alistair Darling is expected next week to downgrade the government's forecast for the growth of the UK economy in 2008. In an interview with the Financial Times, Mr Darling said that there would "undoubtedly be an effect" on Britain from the credit crunch. The chancellor is expected to reduce the growth forecast from 3.0% to 2.5%. The forecast will come in the pre-Budget report, which Mr Darling will deliver to Parliament on Tuesday. The report, as well as the Comprehensive Spending Review, had been expected later in the month, and the fact that it has been brought forward has fuelled speculation that there may be a November election. A 2.5% growth forecast would still be optimistic compared with City analysts, the average of whose predictions is 2.2%. Mr Darling is expected to blame the slowdown on overseas factors. "Given the importance of the US economy and given what's happened here in relation to the effect it will have on the availability of credit, it would be fairly odd if you didn't take account of that," he told the FT. The problem for the chancellor is that lower growth means the government would raise less in taxation because of lower spending and company profits. A slowdown could also make it more difficult for Mr Darling to meet borrowing targets for the current financial year. "We've been sceptical over the strength of the Treasury's forecast for some time, and given the credit squeeze there are even more downside risks," said Investec chief economist Philip Shaw. "The chancellor is picking up the reins of the economy at a difficult juncture." A budget for better or worse? What do you make of Darling's review?